Defining You is the shortcut to psychological profiling for professionals and business leaders, complete with tests, analysis and guidance. I began reading this book solely to review it, yet early on I became an active participant in Fiona Murden’s system outlined in “Defining You.” Hopefully, my personal experiences will help you decide that this book will be helpful. Early on, I was able to see that this was not going to be a common, everyday self-help book. Not only are the exercises more in-depth and require you to be extremely introspective, but Ms. Murden has achieved her goal of giving each participant a virtual psychologist to help with understanding their personal data (I use the word participant rather than reader in this review, as readers will gain some knowledge from this book while participants will achieve a great amount of personal insight). Early exercises help reveal how our childhood and then early adulthood has helped to fashion us into the people we are today. Ms. Murden encourages documenting both positive and negative events on our personal timelines, and she follows this exercise with additional questions to help us probe deeper. I found these exercises to be of great worth, revealing information about myself that has impacted my life in ways to both promote me while at times holding me back. The negatives are “beliefs” which I had reinforced over the years and believed to be true. There is an opportunity to take a psychometric measurement, another tool in ascertaining more about yourself. In this case, it is a personality measurement. There are multiple methods the company offers to achieve this (I chose to complete it online), and I liked that I had the ability to protect some of my personal data, as well as requesting for it to be deleted. Once you have collected and reviewed your personal data the author shows you how to put it all together in a way that makes sense and will become a platform upon which you can construct your future goals and accomplishments. The book is broken into logical sections and chapters (which Ms. Murden refers to as “sessions”). Knowledge and insight are shared, although the author (perhaps recognizing the difficulty for anyone to make changes) allows a flexibility in the tasks. I see the value in this technique, as it would be better to perform a lighter version of a task than to become frustrated and set the book aside. And, as the author reminds us, we can always return to the harder tasks at a later date. 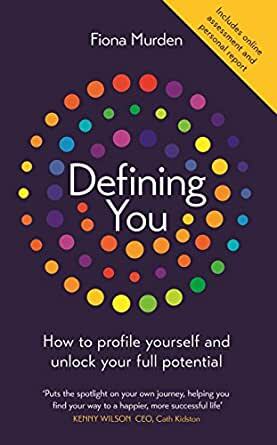 Over the years, I have read well over 100 books dealing with self-development and “Defining You” is by far the best of the lot. Ms. Murden’s writing style makes you feel as if she was there, giving guidance whenever needed, and helping you to establish your purpose and achieve your goals. If you are willing to put in the time, using the book as a textbook/workbook, I guarantee you will walk away with a treasure trove of personal knowledge that will aid you in your efforts to live a challenging and fulfilled life. Five stars. This book is incredibly valuable for anyone who wants to understand their blind spots better. I initially heard about this book after reading a glowing review, and I wanted to get to the bottom of some situations I found myself getting stuck in again and again. The insight I got from this book completely helped illuminate patterns about myself I could apply to my professional and personal life. The online resources are thorough and helpful, really an amazing value given the cost of the book. Highest recommendation! "Defining You," by British psychologist Fiona Murden, is one of the best books I've encountered designed to analyze your personality and how to improve your interactions with the world to create a more effective person. The subtitle of this book, "How to profile yourself and unlock your full potential," really says it all when it comes to the purpose for which it was written. Its 244 pages of text are well-written and cover the topic thoroughly without being in any way boring or pedantic. This is an enjoyable book to read, and as I went through it, I almost felt that Ms. Murden was sitting next to me and helping me to understand my personalty so that I could indeed unlock my potential. One especially helpful feature is found in Chapter 5, the one on psychometrics. In it, the author not only describes what psychometrics is and how it can help you understand your personality, but she directs the reader to a personality measure called "Credo," which is "designed to collect and summarize information about your preferences, interests, emotions, and style of relating to others" (p. 99). Murden then provides the internet address of the company that administers the test, which is free for readers of "Defining You." In sum, "Defining You" is well worth your time and effort, and if you are willing to seriously heed the advice, has the potential of making you a more effective person.